Fortunately I've been spared from having to do this lately, but adding this tip here in case Murphy's Law comes into effect. 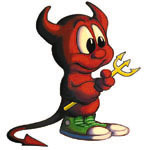 Previously when I dual booted FreeBSD with a NT flavour of Windows I'd always install the latter first, owing to it's tendency to shamelessly screw with boot orders and MBRs like the monopolistic Borg creature it is. Not that I'm bitter or anything. If other operating systems have damaged your Master Boot Record, you can reinstall it either with /usr/sbin/sysinstall or with boot0cfg(8). See man boot0cfg for details. Newer post ← Can you print a blank page?